VINTAGE BARBIE CLOTHES NEW! GREAT DRESS FORM DISPLAY MANNEQUIN BACK IN STOCK! New ListingBarbie Brunette Bubble Cut NIB. With Stand, unopened shoes, book,Wrist Tag! Here is a lot that includes 4 shown dolls and at least 50 clothing aticles many appear from 1960s. one doll i have been advised is 1990s, other possibly 70s and the one on the far right is a swirl ponytail. Vintage Barbie lot/ 5 Dressed dolls and 15 extra pc. clothing. Condition is Used. Shipped with USPS Parcel Select Ground. Vintage Barbie 1960's TLC Lot. Condition is Used.These guys need serious TLC.Not for picky collector.Bid with problems in mind. Vintage Barbie Mattel TNT Twist and Turn Doll. Played with condition. Nice tight limbs legs click and hold pose. Fantastic original makeup! Nice long full lashes. Pink Body nice and even toned. A little dirty as shown in photos. Hair has not been cut and is nice and long! light brown in color. Please note the Necklace is homemade. Stand NOT Included Thank you! Outfits may or may not be complete. We put rulers so you can see the sizes. They are all for barbies. wedding dress and veil. and much more. Small lot of clean old Barbie clothes with no tears. Francie's yellow dress is missing the decorative buttons on the front. Skipper's pink coat has a small spot of discoloration on one sleeve which photography could not pick up. Lot of Vintage 1960’s thru 1980 Barbies / 1961 Barbie Doll Case Clothes /Misc. Vintage Barbie doll clothes 1960's. Condition is Used. Shipped with USPS .Some are better than others.TLC. 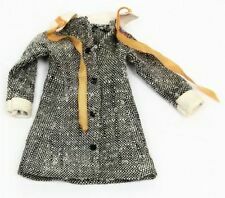 The jacket has a fluffy fur collar and one square snap to keep closed on the doll. Excellent Dress and Jacket set. OVERALL VERY GOOD CONDITION. THIS DOLL IS MUCH LIGHTER IN WEIGHT THAN THE REGULAR BARBIE. Awesome lot fresh from an estate. The boxed Midge doesn’t appear to ever have been removed from the inner box. Still has a plastic sleeve around her head. The outer box isn’t perfect but very displayable. (4) 1958 marked Barbies. The two long haired ones do show some hair loss but still enough to display nice. Theres only a few Barbie tagged clothes. The MOD top is marked Japan. A few of the figures have loose arms but overall its a great lot for the collector. Any questions please ask away. Vtg Barbie (Malibu?. in an Olympic outfit, red color has bled onto the white as shown. doll has all digits, hair needs a combing. hangers, lei, parrot, Superstar clothes and booklet. 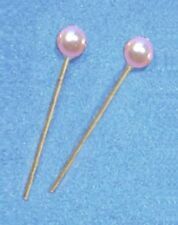 pearl beaded necklaces, sunglasses, and more! ). Vintage Barbie, Midge, Francie, Doll Lot. Six dolls, 3 Ken items, 39 pieces of clothing for Barbie...12 positive Authentic Mattel items and the rest are home sewn clothes. Some of the clothes are in need of repair. Most have been gently hand washed. Most of the dolls are excellent with no issues. The francie doll has a green stain inside but showing her head. One has hair eyelashes. 48 total number of items. Shipped with USPS Priority Mail. Original red helencia Swimsuit, matching OT heels, Booklet and stand. Her hair is in excellent condition with no missing plugs or hair cuts. Makeup appears original- no fading noted. Body is very clean - no marks or scratches noted. Clothes for Ken and other males, Barbie and Barbie sized clothing, other unidentified dolls (Tammy, Etc). I decided to give up sorting and leave that to the collectors. Original living barbie and living skipper book. Excellent condition. hair thingy. Barbie: Vintage DEBUTANTE BALL Dress! Her hair has not been cut and there are no missing hair plugs. She has her original top knot. Her makeup is perfect with no retouches. 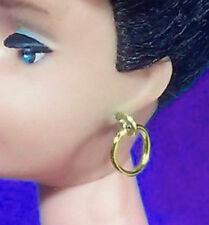 She has no extra earring holes no green no neck splits.She does have a few small blue spots on her legs very minor She is marked Barbie. Net proceeds from the sale of these goods and financial donations from the community make it possible for us to operate our free job training programs. Because Jobs Change Lives! This also applies to combined orders. There is no green and she maintains her red nails and toes. Her face is unblemished as well. Plus, she is not sticky. vintage barbie Doll Clothing Lot Doll And Clothes B. Condition is Used. Shipped with USPS First Class Package. Not a professional on Barbie Any questions feel free to ask, 2 dolls marked Japan on the foot and one doll missing hair in the back she’s one of the ones marked Japan the clothing seems to be in nice condition crisp like it wasn’t played with much any questions feel free to ask and I will review the items. VINTAGE 1960s BARBIE "NIGHTY NEGLIGEE" OUTFIT #963 OUTFIT COMPLETE JAPAN MINT! 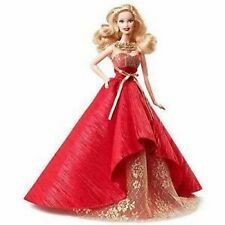 Mattel put the first Barbie Doll in stores in 1959, and dolls made between 1959 and 1973 are often referred to as vintage Barbie dolls by collectors. 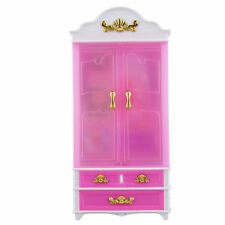 The era is divided into the Vintage Barbie period of 1959 to 1966 and Mod Era between 1967 to 1972. 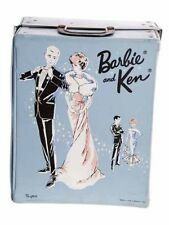 Clothing, accessories, cases, and friends and family like Midge and Ken, round out the vintage Barbie dolls and products available from the 1959 to 1973 Barbie era. What types of vintage Barbie doll are there? With seven different versions, Mattel made Vintage Barbie Ponytail Dolls between 1959 and 1964. Other versions made before 1966 include Fashion Queen, Swirl Ponytail, American Girl (1965-66), Bubblecut, and colour Magic. Miss Barbie was the first doll in the series with bendable legs. Hair colours from this period include brunette, blonde, and red. The short Bubblecut hairstyle was inspired by First Lady Jacqueline Kennedy. 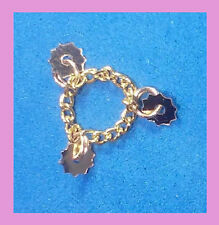 The earliest versions have simple clothes and gold or pearl earrings. The Fashion Queen model has molded plastic hair and three styles and colours of wig. Which Barbie friends and family are available from 1959-1973? Midge is Barbie's best friend, introduced in 1962. Midge's body type is the same as the Barbie of the same time period. Ken dolls, named after the creator's son, were introduced in 1961. New Good Lookin', Live Action, Busy and Busy Talking, Walk Lively, Sunset Malibu, and Mod Hair Ken are available from 1969 to 1973. What are Mod Barbie dolls made from 1969 to 1973? Mattel made Mod Barbie dolls between 1969 and 1973, including Twist 'n Turn Barbie with bendable legs, a twisting waist, and straight long hair. A swinging 1960s wardrobe added to the mod theme, which also included a Twist 'n Turn face makeover with eyelashes and mod features. Talking and Living Barbie are variations from the late 1960s and early 1970s. Which types of Barbie doll accessories are available? In addition to 1960s and early 1970s clothing and fashions, many variations of accessory may be found for vintage Mattel dolls that include shoes, jewellery, glasses, and gloves. Open- and closed-toe shoes from 1959 to 1966 come in white, black, brown, red, green, yellow, orange, navy blue, and occasionally, bright colours like fuchsia. Clear, open-toed shoes have gold and silver glitter. Sunglasses in several colours of frame and lens along with pearl necklaces and long and short formal gloves round out the clothing accessories from the vintage period. Which vintage cases or trunks can be found? The first official cases for Barbie were made in 1961. Early cases are marked "Ponytail," and by 1962, cases that would fit a Ken doll and several Barbies emerged. By 1964, cases for the Barbie doll, her younger sister Skipper, and friend Skooter were available, including a Barbie doll with a medium red Titian bubble-cut hairstyle. Skipper and Skooter are smaller dolls and so have smaller cases. Francie, Stacey, and Casey all come in specialized cases.